President Maithripala Sirisena says that Sri Lanka has not been accused of committing any ‘international war crimes’ and reiterates that he will never allow the participation of foreign judges in the mechanism to investigate allegations of human rights violations. The President said that former foreign minister Mangala Samaraweera agreeing to co-sponsor a resolution at the UN Human Rights Commission in Geneva proposing the involvement of foreign judges in investigating allegations of human rights violations, was the reason he was removed from that position. The President stated that he did not agree to the involvement of foreign judges then and he does not agree with it now. Sirisena said that he very specifically told every head of state and also the UN Secretary-General that he will ensure that the policies and agreements within the UN Charter, are safeguarded in the country. “Therefore I told them not to send foreign judged to my country. 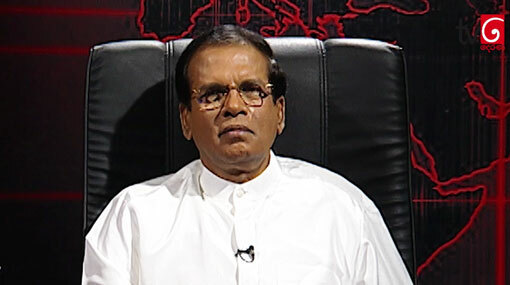 There will be no international war tribunals or electric chairs,” he said, in an interview with Derana 360°. Responding to a question, the President emphasized that there is no such written agreement guaranteeing participation of foreign judges as claimed especially by certain pro-LTTE non-governmental organizations of the Tamil diaspora. The President stated that while he does not agree in any way with certain points in the agreement reached, the resolution does not contain any such thing as claimed by certain groups. He said that certain group abroad who are against the government and even certain groups within the country are attempting to portray a different opinion, but there is absolutely nothing in writing officially accusing Sri Lanka of committing international war crimes within the UN resolution any other document.